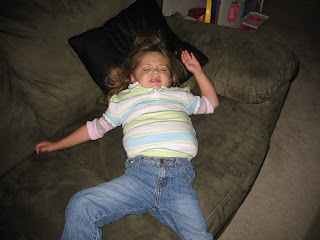 I went to wake Jaeden up from her nap and when I went to pick her up, she felt so bulky. I brought her down stairs and saw that she had on multiple shirts. She told me she wanted her shirts off so I started taking them off thinking there was maybe 4 or 5 on. I kept on counting and got to 12. I couldn't stop laughing.